"The temple center is started just to present example to the neighboring residents how they can make a small temple in each and every home. It is not necessary that hundreds and thousands of people will live in our temple, but if we can make effective propaganda, then the neighboring residents, householders, will be inclined to be initiated and follow the modes of temple life. "So you encourage the visitors, boys and girls as well as married couples, to understand the value of life and how they can peacefully and happily live if they follow the routine worship method in the temple and establish this in their home to be happy in all respects. 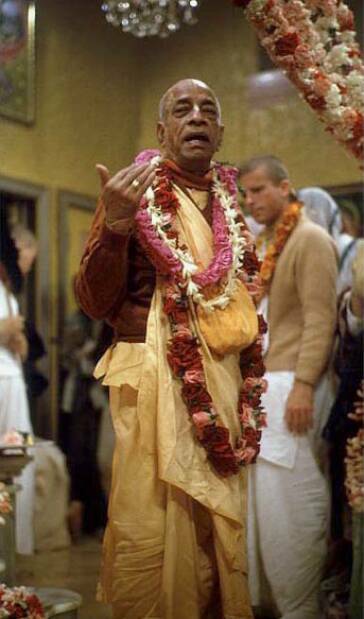 "Krishna Consciousness Movement is actually an attempt to make all people happy generally and, becoming liberated in this life from material contamination, they'll be thus eligible to enter into the Kingdom of God after quitting this body."